Mercedes-AMG is redefining the performance saloon. The brand is turning the most intelligent executive saloon into the most powerful E-Class of all time – in the shape of the next-generation E 63 4MATIC+ and E 63 S 4MATIC+. Mercedes-AMG is also setting new benchmarks in this market segment with its innovative technologies. The intelligent drive strategy raises the limits of the performance saloon’’s vehicle dynamics to a completely new level. Delivering even faster acceleration, the 4.0-litre twin-turbo V8 engine generates up to 450 kW (612 hp). 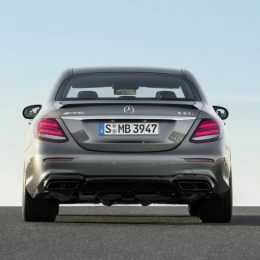 This makes it the most powerful engine ever installed in an E-Class. It’s also even more efficient thanks to a cylinder deactivation system fitted as standard, therefore setting the benchmark in its segment. With acceleration from 0 – 62 mph in 3.4 seconds the new business limousine is at the top of its class.The AMG SPEEDSHIFT MCT (Multi Clutch Technology) nine-speed sports transmission is combined with a wet start-off clutch for the first time. This allows more agile response times to be achieved. Another highlight is the completely new AMG Performance 4MATIC+ all-wheel drive system. It combines the advantages of various drive configurations. Torque distribution on the front and rear axles, which until now was strongly rear-biased, is fully variable for the first time. This ensures optimum traction right up to the physical limit, whatever the road conditions. The exterior design, featuring a new radiator grille and coupé-style inset bonnet, underlines the performance figures. 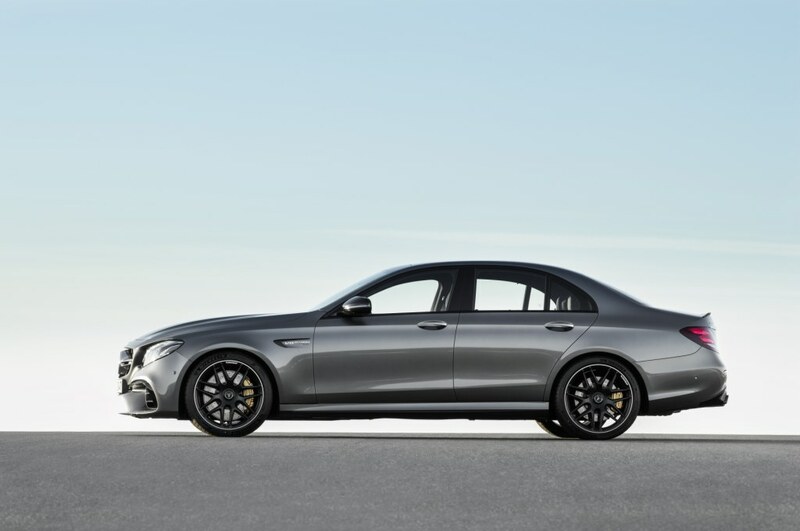 The next generation of the E 63 thus offers a completely new level of sportiness and comfort. 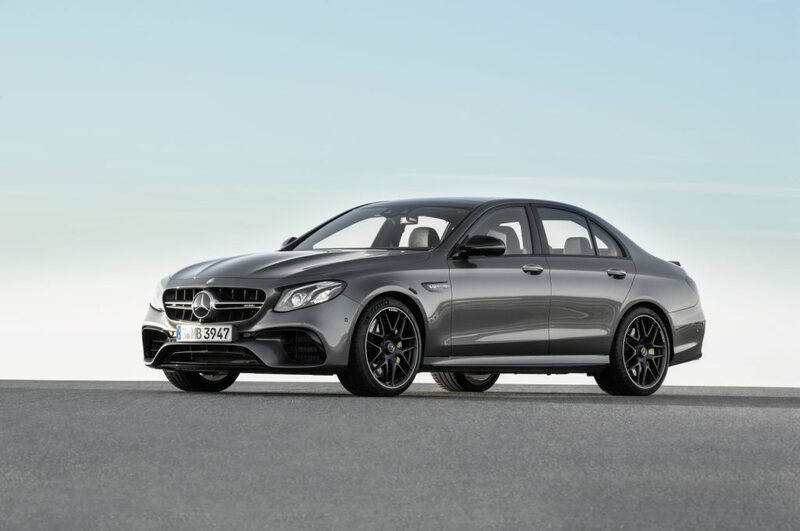 In the latest generation of the E 63 4MATIC+ and the E 63 S 4MATIC+ Mercedes-AMG is introducing a number of new developments that redefine the performance saloon. Innovative powertrain engineering and maximum performance are combined with distinctive design, exclusive equipment and the latest infotainment features for comprehensive, connected multimedia applications. 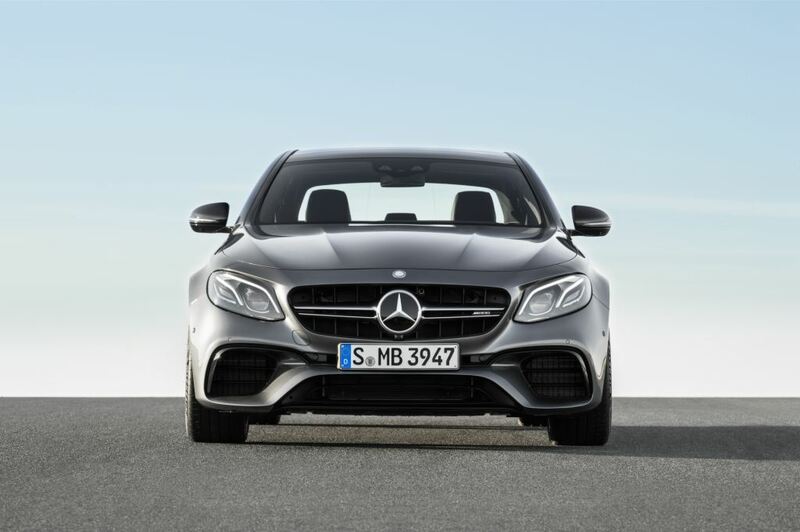 ““The new E 63 models represent the biggest step forward we’’ve ever taken from one generation to the next. Vehicle dynamics were especially important to us. At the start of the development process, we opted for a fully variable all-wheel drive system which, when combined with the advanced performance of the 4.0-litre twin-turbo V8 engine, reaffirms our brand’’s ““Driving Performance”“ claim,”“ explains Tobias Moers, Chairman of the Board of Management of Mercedes-AMG GmbH. The exterior design is all about sinuous edges and defined muscles. 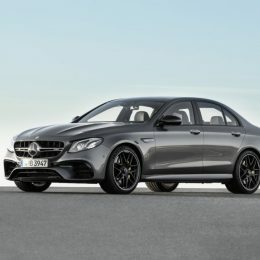 With a completely distinctive design forward of the A-pillar, the sporty front also demonstrates the effort that Mercedes‑AMG has put into the styling: for the first time on an AMG saloon, the bonnet is inset between the wings and bumper like on a coupé, thus exhibiting an entirely new, more dynamic approach to the sculpting. More powerful-looking and 17 millimetres wider, the wheel arches accommodate the greater track width and the larger wheels on the front axle. The new radiator grille with twin louvres in silver chrome, vertical black struts and ““AMG”“ lettering likewise emphasises the distinctive look. The wide front apron is inspired by the design of a jet wing, while flics in black and a large front splitter epitomise the power of the new models. It also showcases the sophisticated cooling technology – a typical feature from motorsport and another visual reference to the powerful engine. The two louvres in the outer cooling-air intakes also help in this regard, their targeted wing profile directing air to the wheel arch coolers. The side view reinforces this impression by way of numerous, carefully matched elements. One special detail is the arrow-shaped wing signet in silver chrome bearing three-dimensional ““V8 BITURBO 4MATIC+”“ lettering – an eye-catching way to highlight the drive system. The side sill panels make the saloon appear to sit even lower on the road and elongate the overall line. Inserts in silver chrome differentiate the S model. 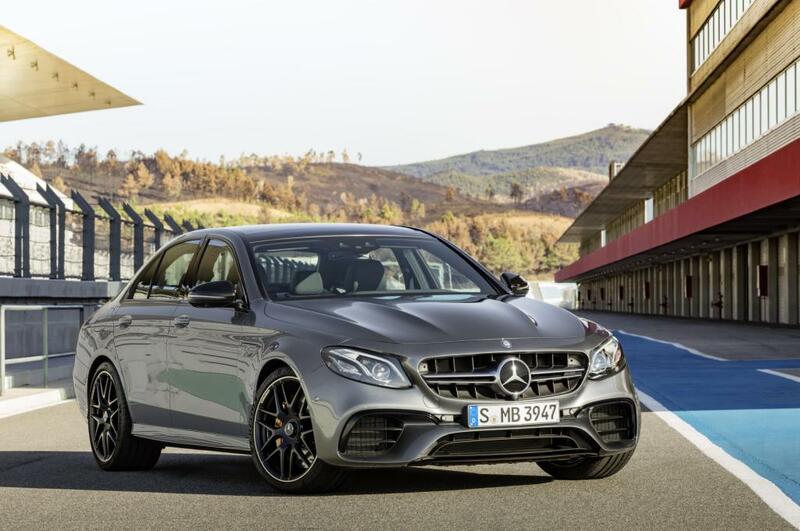 As standard, the E 63 4MATIC+ comes with 9.5 J x 19 (front) and 10 J x 19 (rear) 10-spoke light-alloy wheels painted titanium grey with a high-sheen finish, with tyres in size 265/35 ZR 19 (front) and 295/30 ZR 19 (rear). The E 63 S 4MATIC+ runs on tyres of sizes 265/35 ZR 20 (front) and 295/30 ZR 20 (rear) mounted on 9.5 J x 20 (front) and 10 J x 20 (rear) 5-twin-spoke light-alloy wheels, painted matt titanium grey with a high-sheen finish. A new design of 20-inch cross-spoke forged wheel, which looks as though it is centrally locked, is available as an option. The muscular rear end provides the finishing touch in conjunction with the clearly defined spoiler lip in the colour of the vehicle on the boot lid, the rear apron with diffuser-look insert, and the two bright chrome-plated twin tailpipe trim elements on the selectable sports exhaust system. The E 63 S 4MATIC+ also features a trim strip in silver chrome on the rear apron. 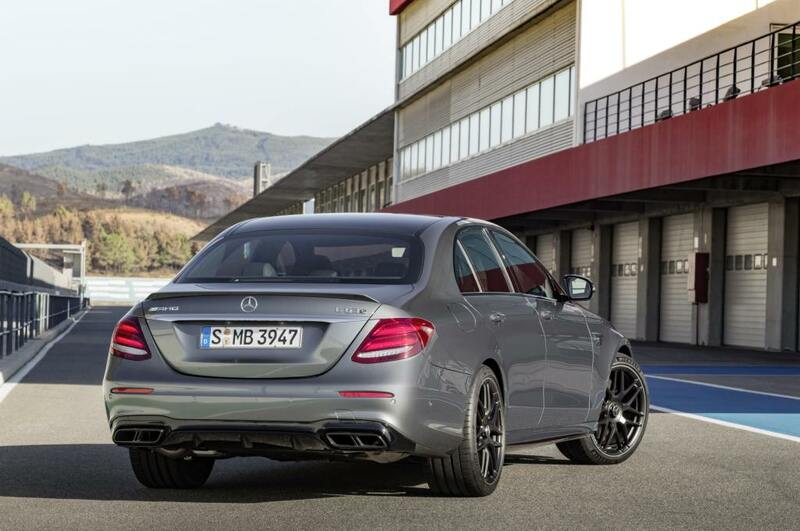 Designers and aerodynamics experts worked together to develop the E 63 4MATIC+. Their insights not only resulted in the striking AMG bodystyling but also the performance-oriented lift balance – for agile handling characteristics on country roads and optimum driving stability at high speeds on the motorway. The developers also placed great importance on achieving a low level of wind noise, minimal aerodynamic drag for low fuel consumption, and thermal robustness for all systems. 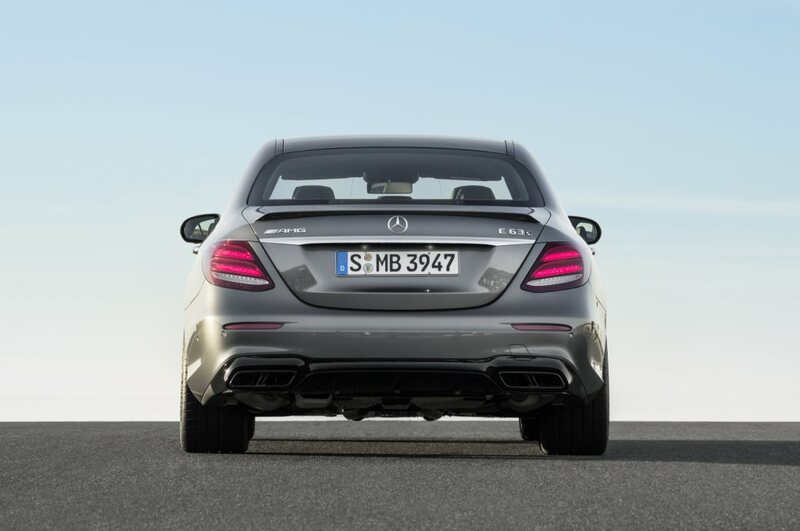 Adapted to the saloon’’s airflow and topography, the clearly defined rear spoiler eliminates lift on the rear axle. The versatile AMG 4.0-litre twin-turbo V8 engine in the E 63 S 4MATIC+ takes peak performance to a new level at 450 kW (612 hp). Maximum torque attains a new best value of 850 Nm. It is available over a broad engine speed range of 2500 to 4500 rpm. 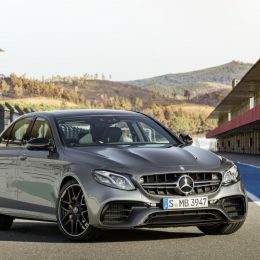 A sprint from zero to 62 mph is achieved in 3.4 seconds, and this dynamic acceleration only ends at the governed top speed of 155 mph (with AMG Driver’’s package: 186 mph. The E 63 4MATIC+ is rated at 420 kW (571 hp) and has 750 Nm of torque. This variant accelerates to 62 mph in 3.5 seconds. The advanced AMG 4.0-litre V8 biturbo engine utilises well-proven twin turbocharging, with the two chargers not located outside on the cylinder banks, but rather between them in the V of the cylinders. The advantages of the ““hot inner V”“ are a compact engine design, an immediate response from the twin-scroll turbochargers and low exhaust gas emissions thanks to optimum air flow for the close-coupled catalytic converters. Two twin-scroll turbochargers are deployed for the first time to boost performance and further improve responsiveness. The housing is divided into two parallel flow passages. Combined with two separate exhaust ducts in the exhaust manifold, this makes it possible to control the exhaust gases on the turbine wheel separately. The exhaust gas from the first and fourth cylinders of the cylinder bank is fed into one duct and exhaust gas from the second and third cylinders to the other duct. The aim is to prevent the individual cylinders from having mutually adverse effects on the gas cycle. This reduces the exhaust gas back pressure and improves gas exchange. The results are increased output due to improved cylinder charge with fresh mixture, more torque at low revs and very immediate response times. Other engine measures include new pistons, an optimised air intake and charge air cooling, as well as extensive software developments. Spray-guided direct petrol injection with piezo injectors, the all-aluminium crankcase, the four-valve-per-cylinder design with camshaft adjustment, air-water charge air cooling, alternator management, the ECO start/stop function and the gliding mode have all been retained. The eight-cylinder engine offers exceptional power delivery and powerful acceleration in all engine speed ranges combined with maximum efficiency for low consumption and emission values. For maximum efficiency, Mercedes-AMG has equipped the V8 engine with the AMG Cylinder Management cylinder deactivation system. This already helped the SLK 55 to achieve impressively low consumption and emission values and is now being used with a turbocharged engine from Mercedes-AMG for the first time. In the partial-load range cylinders two, three, five and eight are deactivated, which crucially lowers the fuel consumption. 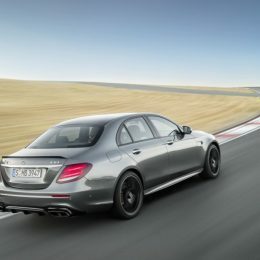 With combined fuel consumption of 8.9 litres (31.7 mpg) and CO2 emissions of 203 grams per kilometre (combined), the E 63 4MATIC+ and E 63 S 4MATIC+ set a new best by comparison with their competitors. When the driver has selected the ““Comfort”“ transmission drive program, the cylinder deactivation system is available in a wide engine speed range from 1000 to 3250 rpm. 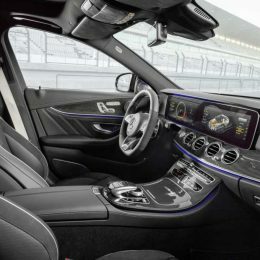 The AMG main menu on the instrument cluster informs the driver whether the cylinder deactivation system is in use and whether the engine is presently operating in the partial or full-load range. The transition from four to eight-cylinder operation is immediate, fast and imperceptible, so that the passengers do not experience any loss of comfort. This is made possible by intelligent interaction between the high-performance engine management system and CAMTRONIC valve lift adjustment, which is familiar in a similar configuration from the four-cylinder engines. There are eight dual actuators involved in half-engine mode, which operate the axially sliding cam units of the intake and exhaust camshafts via a shift gate. Half-engine operation is achieved by shutting off the relevant intake and exhaust valves of cylinders two, three, five and eight. This not only enables the load-change losses of the four deactivated cylinders to be reduced, but also increases the efficiency of the four remaining cylinders. The reason for this is to shift the operating point to higher loads. 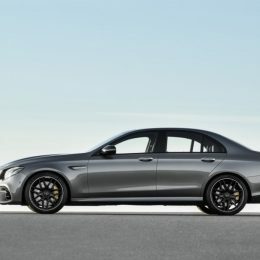 Both E 63 models are exclusively available with the innovative AMG Performance 4MATIC+ all-wheel drive system. This newly engineered, intelligent system brings together the advantages of various drive configurations. Torque distribution on the front and rear axles, which is fully variable for the first time, ensures optimum traction right up to the physical limit. The driver is also able to rely on high driving stability and handling safety under all conditions, whether the roadway be dry, wet or snow-covered. The transition from rear-wheel to all-wheel drive and back again is seamless, because intelligent control is integrated into the vehicle system architecture as a whole. An electromechanically controlled coupling connects the permanently driven rear axle variably to the front axle. The best possible torque distribution is calculated continuously according to the driving conditions and driver’’s input. The performance saloon can therefore be driven in a continuously variable way from traction-oriented all-wheel drive to purely rear-wheel drive. Transitions are seamless and based on an elaborate matrix. In addition to traction and lateral dynamics, the all-wheel drive system also improves the longitudinal dynamics for even more powerful acceleration. It is still possible to drift thanks to fully variable torque distribution. This is where drift mode, part of the standard specification for the E 63 S 4 MATIC+, comes into its own. This can be activated in the ““Race”“ drive program using the shift paddles, provided that ESP®is deactivated and the transmission is in manual mode. When drift mode is activated, the E 63 S 4MATIC+ becomes a purely rear-wheel drive vehicle. Drift mode remains engaged until the driver deactivates it again. The AMG SPEEDSHIFT MCT nine-speed sports transmission is specially tuned to requirements in the new E 63 4MATIC+ and E 63 S 4MATIC+. This involved re-engineering hardware and software alike. A special software development enables extremely short shift times, fast multiple downshifts and the double-clutching function, making for a highly emotive gearshifting experience. A wet start-off clutch replaces the torque converter. This saves weight and optimises the response time to the driver’’s accelerator pedal input, particularly when accelerating and during load changes. The four different AMG DYNAMIC SELECT drive programmes ““Comfort”“, ““Sport”“, ““Sport Plus”“ and ““Individual”“ allow drivers to extensively influence the characteristics of their E 63 4MATIC+. Key parameters are modified such as the response of the engine, transmission, suspension, steering, ESP®and all-wheel drive system. Independently of the DYNAMIC SELECT drive programmes, the driver has the option of pressing the ““M”“ button to switch directly to manual mode, in which gearshifts are executed exclusively using the shift paddles on the steering wheel. Different suspension set-ups can also be selected if desired. ““Comfort”“ is the well-balanced drive programmes with a comfort-oriented suspension and steering set-up, as well as a fuel-efficient powertrain configuration and early upshifts – including smooth gear changes and a discreet engine sound. Cylinder deactivation, the ECO start/stop function and gliding mode are on: when the driver releases the accelerator in a speed range between 37 and 99 mph, the clutch of the MCT transmission opens and the engine is decoupled from the powertrain. The electronics reduce the engine speed to idle level, and the motion resistance is reduced by the compression and frictional forces of the engine in overrun mode. The DYNAMIC SELECT ““Sport”“ and ““Sport Plus”“ drive programmes are designed for high vehicle dynamics. This results from an agile accelerator pedal characteristic with direct set-up and emotively appealing shift operations with shortened shift times and double-clutching function on downshifts. The increased idle speed in ““Sport Plus”“ mode additionally enables the vehicle to move off particularly quickly while ensuring faster acceleration from rest. The E 63 S 4MATIC+ also comes with the ““RACE”“ drive programme for highly dynamic driving on closed race circuits. Here all parameters are designed for maximum performance. The control logic for the RACESTART function is new and has been simplified considerably. In the Sport, Sport Plus or RACE drive programmes, all the driver has to do is press the brake pedal forcefully with their left foot and simultaneously fully depress the accelerator pedal with their right foot. The on-board electronics will now set the optimum engine speed. Depending on requirements or the road surface conditions, the engine speed can be increased or lowered in either direction by activating the shift paddles. If the driver now takes their foot off the brake pedal, the E 63 4MATIC+ will accelerate from rest with optimal traction. 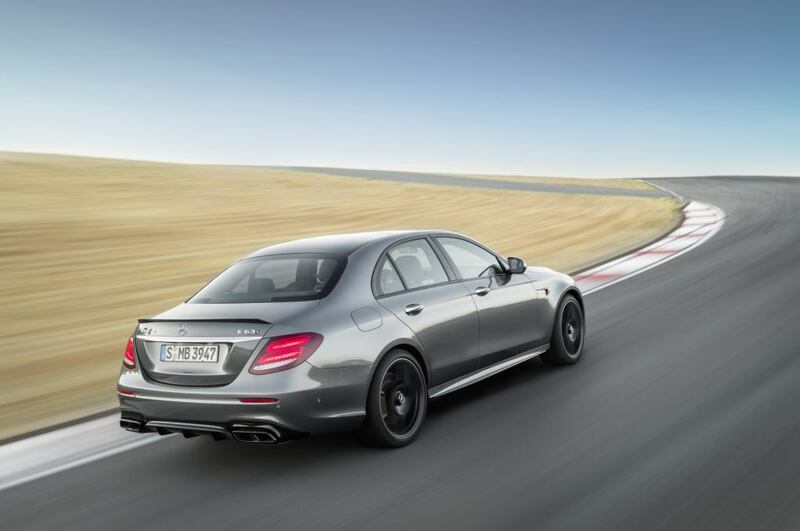 The S‑Model completes the sprint from 0 to 62 mph in 3.4 seconds, whilst the E 63 4MATIC+ takes 3.5 seconds. 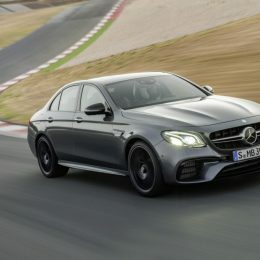 The agility and high cornering speed of the new E 63 4MATIC+ and E 63 S 4MATIC+ are also benefits of the completely re-engineered AMG sports suspension. It is based on the AIR BODY CONTROL fully supporting multi-chamber air suspension and affords very high camber stability. The vehicle dynamics and steering precision are also combined with a high level of comfort. A four-link front axle design uses forged aluminium components with wishbones, strut rod and spring link. The suspension strut supports the vehicle weight via the supporting link across from the body. Independent wheel control and wheel suspension parts combined with the increased track width enable higher lateral acceleration, but minimal torque steer on the steering system. Likewise model-specific, the entirely re-engineered rear axle was adapted specifically to the new performance saloon’’s increased vehicle dynamics. The multi-link concept offers highly precise wheel control and increased stiffness. The AMG-specific rear axle carrier makes the wider track possible, with the contact surfaces of the wheel bearings having been moved out compared with the Mercedes-Benz E-Class saloon. Other measures include AMG-specific wheel carriers, elastokinematic tuning optimised for vehicle dynamics and higher negative camber. Newly developed elastokinematicsguarantee the comfort expected from the E-Class combined with high precision and vehicle dynamics. The rear axle differential has a new mount to improve the NVH (noise, vibration, harshness) characteristics. Additional bracing measures and welds also make a contribution in this regard. As on the AMG GT R, an anti-roll bar made of tubular material reduces the weight of the rear axle. It has been adapted to the increased vehicle dynamics of the new performance saloons. The radial brake connection has been derived from motorsport. It also helps to make the handling more agile and precise because it provides increased rigidity to counter the vibrations and forces that the suspension produces. Due to the special rubber bushes on the axles and the new elastokinematics, it was possible to improve camber stability by 30 percent compared to the previous AMG model. The air suspension system with three chambers, a sporty spring damper set-up and continuously adjustable damping also takes the ability to individually tailor the driving experience to a new level. It combines exemplary vehicle dynamics with good road roar and tyre vibration characteristics. The rigidity of the air springs can be fine-tuned by activating or deactivating individual air chambers. This results in a tangible increase in comfort, as well as having a positive effect on handling. By carrying out extended series of trials and test drives, the developers at AMG have defined three spring tuning settings depending on the selected drive program and the actual driving conditions. During sudden load changes, fast cornering, heavy acceleration or hard braking, the spring rate is also automatically made harder on the front or rear axle. This reduces roll and pitching effectively and stabilises the performance saloons. In the ““Comfort”“ programme the suspension is heavily oriented towards providing a comfortable ride. Irregularities in the road surface are absorbed and the four-door model travels smoothly. In ““Sport”“ mode, the E 63 4MATIC+ and E 63 S 4MATIC+ handle significantly more dynamically with reduced roll thanks to a harder spring rate. ““Sport Plus”“ mode delivers further enhanced agility and cornering ability because the front and rear axles have an even more rigid suspension. The customer can set the adaptive damping in three stages – Comfort, Sport and Sport Plus – to choose between relaxed comfort on long journeys and maximum sportiness. The rebound and compression levels are adjusted independently of each other and the freely programmable characteristics map permits a wide spread between the minimum and maximum damper force. The difference between the comfortable and sporty suspension setting is thus more refined and is subjectively even more perceptible – depending on the particular driving situation. The complete package is compelling: the E 63 4MATIC+ and E 63 S 4MATIC+ combine steering precision and the highest level of longitudinal and lateral dynamics with maximum traction, while at the same time boosting ride comfort. 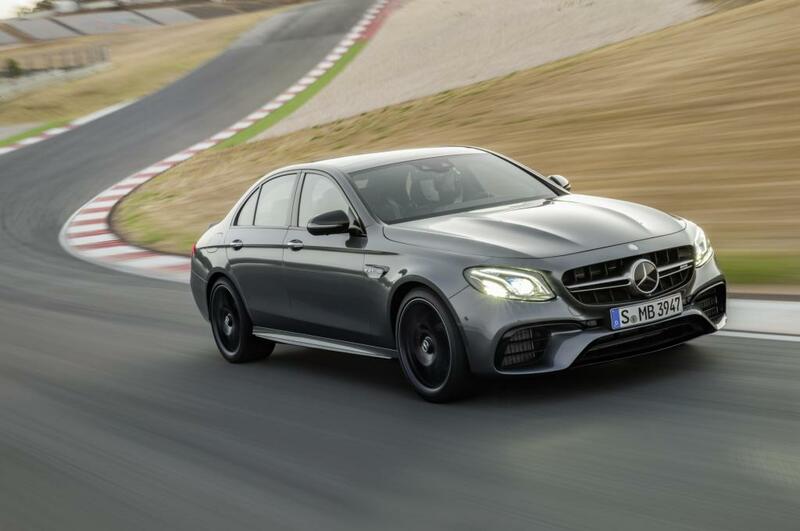 To improve traction and vehicle dynamics the E 63 4MATIC+ has a mechanical rear differential lock and the E 63 S 4MATIC+ has an electronically controlled rear differential lock. Both differentials reduce the slip on the inside wheel when cornering, without control interventions in the braking system. This ensures that the driver is able to accelerate out of corners earlier and with more power thanks to the improved traction. The car remains more stable when braking from high speeds, and the limited-slip differential also improves traction when moving off. The greatest benefit of the electronic rear-axle limited-slip differential is the even more sensitive and proactive control, which pushes the thresholds higher and makes it even easier to drive at the vehicle’s limits. To deliver optimum cooling, the housing of the limited-slip differential has additional cooling fins. The three-stage ESP® with “ESP ON”, “ESP SPORT Handling Mode” and “ESP OFF” settings works in perfect unison with the rear-axle limited-slip differential and AMG 4MATIC+ all-wheel drive system, and is optimally tuned to the outstanding dynamics. Uniquely in this segment, the E 63 S 4MATIC+ is fitted with dynamic engine mounts. These help to solve the conflicting goals of achieving as soft a connection as possible to the powertrain for high comfort and as rigid a connection as possible for optimum vehicle dynamics. The dynamic mounts are instantly and variably able to adapt their stiffness to the driving conditions and requirements. These measures enhance the vehicle’s precision when driven dynamically. The steering response and steering feedback, for example, are thus even more direct. When cornering the ride feels more precise and the driver needs to make fewer corrections because movement of the major assemblies is minimised. On the racetrack there is no compromise on the rigidity of the mounts, which further reduces the major assemblies’ propensity to inertia, and thus helps to improve lap times. Conversely, softer mounts noticeably enhance comfort on poor stretches of road, for example. In the case of undulating surfaces, increased damping steadies the powertrain as quickly as possible. The electromechanical speed-sensitive sports steering features a variable ratio on the E 63 4MATIC+ and the E 63 S 4MATIC+. It stands out thanks to the AMG-specific rack-and-pinion ratio with its precise, highly authentic feedback. Steering power assistance is variably adjusted in the stages “Comfort”, “Sport” or “Sport Plus”. The relevant characteristics are automatically activated depending on the selected DYNAMIC SELECT drive programme or can be personalised in “Individual” mode. At low speeds the driver only needs to provide minimal steering input. At high speed he or she is able to rely on solid straight-line stability. The clearly defined centre bearing and authentic feedback likewise contribute to the optimum steering feel. is fitted with even larger compound brake discs on the front axle in size 390 x 36 mm. For the more powerful variant, the AMG Carbon Ceramic braking system is available as an option with brake discs in size 402 x 39 mm on the front axle and 360 x 32 mm on the rear axle. The three-stage ESP® allows significantly higher vehicle dynamics and driving enjoyment in ESP® Sport Handling Mode and with the ESP® OFF setting. The specific traction logic is active at all times: when a driven wheel starts to lose traction, ESP® applies the brakes in a targeted way for optimum transfer of the engine output to the road. In this way, the three-stage ESP® provides additional safety or more fun at the wheel to suit requirements. ESP® OFF: system deactivated for a sporty driving style on closed circuits. During hard braking ESP® is switched back on temporarily. The new performance saloons have a rigid bodywork structure, which forms the foundation for maximum vehicle dynamics, comfortable handling even on poor stretches of road, and a solid feeling of quality. There are also four struts to additionally reinforce the bodyshell: the two front struts are even stiffer than on the E 43 4MATIC, whereas only the Mercedes-AMG E 63 4MATIC+ and E 63 S 4MATIC+ have the two rear struts. The interior reinforces the consistently dynamic bias with numerous specially designed details. Ideal for a sporty driving style, the performance sports steering wheel in black leather features a flattened bottom section, Touch Control and electroplated shift paddles, as well as a steering wheel bezel with the AMG logo. The driver and front passenger enjoy a secure position in the front sport seats even when driving at speed, thanks to the improved lateral support. There is a distinctive seat upholstery layout in black nappa leather/DINAMICA microfibre, nut brown nappa leather or macchiato nappa leather. The door centre panels match the seat design. AMG Performance seats with integral head restraints can be ordered as an option. Trapezium-grain aluminium trim elements highlight the sporty aspirations. In the E 63 S 4MATIC+ the interior has been refined further. Highlights include a nappa leather covering for the instrument panel and beltlines, the sports steering wheel with crystal grey 12 o’clock marking and contrasting topstitching, AMG crest in the front head restraints, crystal grey seat piping, IWC-designed analogue clock and seat belts in crystal grey. The AMG instrument cluster places all the important information in the driver’s field of vision. Dials in a chequered-flag look and the distinctive typography lend the large, clearly legible displays an especially sporty touch. The vivid widescreen multifunction display with two monitors is part of the standard equipment for the E 63 S 4MATIC+ and is available as an option for the E 63 4MATIC+. Customers with a passion for motorsport will be pleased to note the RACETIMER for recording lap times on closed-off tracks. To supplement the RACETIMER, Mercedes-AMG has developed the new Mercedes me connect AMG TRACK PACE app. Customers can use it to analyse and improve their track driving style and to share this with other AMG drivers via Facebook, Vimeo, YouTube or the AMG Private Lounge. This app for Apple iPhones®is connected to the on-board race app in the head unit via wifi or Bluetooth®. The COMAND Online infotainment system transmits all vehicle data – including speed, gear, steering angle, time, position and temperature – to the app in real time. The smartphone app can also be connected with GoPro cameras so that the driver can obtain an interactive video of their racing experience featuring all the related data. For the new performance saloons, all the connectivity and Intelligent Drive functions and options which make the Mercedes-Benz E-Class the most intelligent executive saloon are available. This includes semi-automated driving with the DRIVE PILOT, which can support the driver during disagreeable routine tasks such as driving in heavy traffic. In addition to the standard Mercedes me connect functions such as eCall, accident recovery, breakdown assistance or after-sales service, Remote Online (standard with COMAND Online) offers numerous convenience features via smartphone, such as tracking to locate the parked vehicle, control of the stationary heater, locking and unlocking the vehicle or the retrieval of various items of information, such as mileage, fuel level or range. 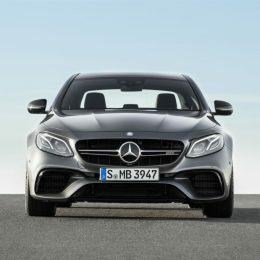 New from Mercedes me connect is the Concierge Service. This includes personal service extending beyond the vehicle. The spectrum ranges from weather and stock market information and route recommendations to suggestions and reservations for sporting and cultural activities. Navigation data is transmitted straight to the vehicle. Customers can call up the Concierge Service using the iCall switch in the vehicle or from anywhere via the Mercedes me app. This new premium service is free of charge for the first year. 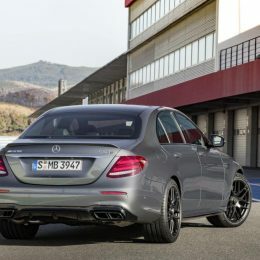 Anyone wishing to personalise their E 63 4MATIC+ or E 63 S 4MATIC+ even further is able to order numerous options from the AMG Performance Studio. The Night package, attractive wheel alternatives and two Carbon-fibre packages can be used to customise the exterior specification. In the interior the Performance steering wheel in nappa leather/DINAMICA microfibre and the Performance seats, which are available for the first time, reinforce the sporty character. Carbon-fibre trim parts or glass-fibre elements in matt silver round off the possibilities. Available for around a year after the market launch, the E 63 S 4MATIC+ “Edition 1” is an exceptionally exclusive and distinctive offering. Complementing the paint finish in night black magno, dynamic stripes on the side sill panels emphasise the elongated side view and underline the forwards thrust of the new performance saloon. Added to this are new AMG 20-inch forged wheels in matt black with high-gloss polished rim flange and the Night package. AMG Performance seats in black nappa leather with yellow topstitching create an exceptionally sporty ambience in the interior. Also colour-matched are the AMG Performance sports steering wheel, door armrests, centre console, AMG floor mats and IWC-designed analogue clock with yellow topstitching or accents. The sports steering wheel in black DINAMICA microfibre features “Edition 1” lettering and a 12 o’clock marking in black. Carbon-fibre trim elements further enhance the exciting juxtaposition of colours and materials. The new performance saloon celebrates its world première as Edition 1 on 16 November 2016 as part of the Los Angeles Auto Show. In the UK, it will go on sale mid-January with first cars arriving from May 2017.